The Narrow Door is literary, smart and poignant, an extended eulogy for a friend and a meditation on friendship. 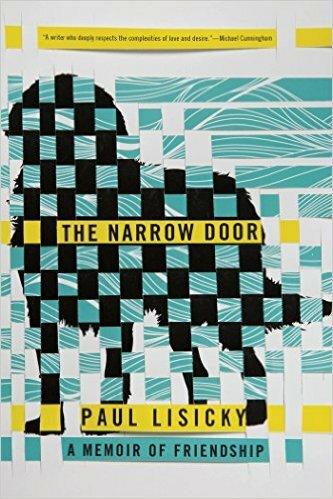 The Narrow Door is a striking memoir of love and loss by Paul Lisicky (Lawnboy; The Burning House). At its center are the life and death of Denise, Paul’s longtime best friend; in parallel, Paul and his husband slowly pull apart and finally break up. The ups and downs of these two relationships define the story Lisicky tells, but they also give him space to muse on larger questions: the craft of writing, competition among writers, the meaning of love and events in the larger world. Paul met Denise in the early 1980s, when they were both teaching assistants at Rutgers. They became fast friends, talking on the phone for hours, sharing the pain and joy of writing. Denise becomes a published novelist first, but Paul’s later success threatens her. A tender passage about “Vincent” and Gauguin, about the painters’ competitive feelings and their wrecked friendship, helps Paul deal with his struggle with instincts leaning both toward and away from competition with Denise. This is only one example of the wide range of Lisicky’s subject: the Deepwater oil spill and the Haitian earthquake likewise influence his reactions to Denise’s cancer diagnosis and other immediate concerns. Paul and Denise are Joni Mitchell fans, and their story is guided by her music. When a hotel in Atlantic City is demolished, Lisicky writes, “It comes down as a person would…. I take it personally.” These disparate threads are tied together expertly, with tenderness, in careful prose. This is an artistic work, poetic and layered and carefully structured. The tangled sequence of events emphasizes the ever-changing nature of relationships and emotional reactions. Lisicky’s tone is sometimes elegiac, sometimes gently humorous, and consistently introspective, questioning. The Narrow Door is not a long book; nonetheless, it requests the reader’s measured consideration of language, pitch, philosophy and emotion. This portrait of a friend in all her complexities is lyrical, intellectual and occasionally challenging. In an austere mood, Lisicky avoids the idea of comfort for its own sake but asks, “Couldn’t there be some rigor to comfort?” The Narrow Door answers with both, in a compelling package. This review originally ran in the January 4, 2016 issue of Shelf Awareness for the Book Trade. To subscribe, click here. Rating: 8 cups of coffee.